The United Kingdom,[Notes 1] being in the British Isles, is ideal for tree growth, thanks to its mild winters, plentiful rainfall, fertile soil and hill-sheltered topography. Growth rates for broadleaved (hardwood) trees exceed those of mainland Europe, while conifer (softwood) growth rates are three times those of Sweden and five times those of Finland. In the absence of people, much of Great Britain would be covered with mature oaks, except for Scotland. Although conditions for forestry are good, trees do face damage threats arising from fungi, parasites and pests. Nowadays, about 12.9% of Britain's land surface is wooded and this area is increasing. The country's supply of timber was severely depleted during the First and Second World Wars, when imports were difficult, and the forested area bottomed out at under 5% of Britain's land surface in 1919. That year, the Forestry Commission was established to produce a strategic reserve of timber. However, the recovery is still very much in progress. Other European countries average from 25% to 37% of their area as woodland. Of the 31,380 square kilometres (12,120 sq mi) of forest in Britain, around 30% is publicly owned and 70% is in the private sector. [Notes 2] More than 40,000 people work on this land. 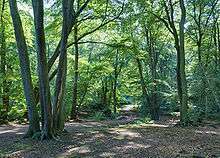 Broadleaves account for 29% of Britain's woodlands, the rest being conifers, but considering only England, the figures are 55% broadleaf and 45% conifer. Britain's native tree flora comprises 32 species, of which 29 are broadleaves. Britain's industry and populace uses at least 50 million tonnes of timber a year. More than 75% of this is softwood, and Britain's forests cannot supply the demand; in fact, less than 10% of the timber used in Britain is home-grown. Paper and paper products make up more than half the wood consumed in Britain by volume. In October 2010, the new coalition government of the UK suggested it might sell off around half the Forestry Commission-owned woodland in the UK. A wide variety of groups were vocal about their disapproval, and by February 2011, the government abandoned the idea. Instead, it set up the Independent Panel on Forestry led by Rt Rev James Jones, then the Bishop of Liverpool. This body published its report in July 2012. Among other suggestions, it recommended that the forested portion of England should rise to 15% of the country's land area by 2060. 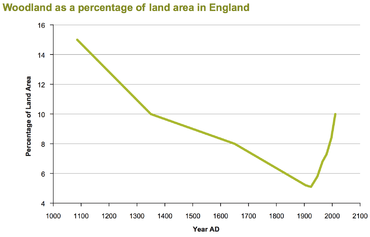 Throughout most of British history, the trend has been to create farmland at the expense of forest. Furthermore, variations in the Holocene climate have led to significant changes in the ranges of many species. This makes it complex to estimate the likely extent of natural forest cover. For example, in Scotland four main areas have been identified: oak dominated forest south of the Highland Line, Scots Pine in the Central Highlands, hazel/oak or pine/birch/oak assemblages in the north-east and south-west Highlands, and birch in the Outer Hebrides, Northern Isles and far north of the mainland. Furthermore, the effects of fire, human clearance and grazing probably limited forest cover to about 50% of the land area of Scotland even at its maximum. The stock of woodland declined alarmingly during the First World War and "a Forestry Subcommittee was added to the Reconstruction Committee to advise on policy when the war was over. The Subcommittee, better known as the Acland Committee after its chairman Sir A. H. D. Acland, came to the conclusion that, in order to secure the double purpose of being able to be independent from foreign supplies for three years and a reasonable insurance against a timber famine, the woods of Great Britain should be gradually increased from three million acres to four and three quarter millions at the end of the war". Following the Acland Report of 1918 the Forestry Commission was formed in 1919 to meet this need. State forest parks were established in 1935. 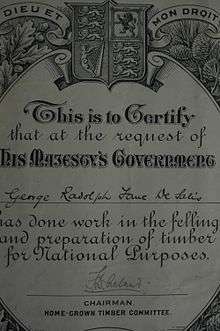 Detail of a certificate awarded by the Home-Grown Timber Committee, September 1916. 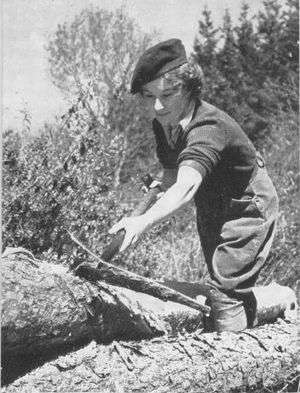 Emergency felling controls had been introduced in the First and Second World Wars, and these were made permanent in the Forestry Act 1951. Landowners were also given financial incentives to devote land to forests under the Dedication Scheme, which in 1981 became the Forestry Grant Scheme. By the early 1970s, the annual rate of planting exceeded 40,000 hectares (99,000 acres) per annum. Most of this planting comprised fast-growing conifers. Later in the century the balance shifted, with fewer than 20,000 hectares (49,000 acres) per annum being planted during the 1990s, but broadleaf planting actually increased, exceeding 1,000 hectares (2,500 acres) per year in 1987. By the mid-1990s, more than half of new planting was broadleaf. Historical woodland cover of England. The Domesday Book of 1086 indicated cover of 15%, "but significant loss of woodland started over four thousand years ago in prehistory". By the beginning of the 20th century this had dropped to 5%. The government believes 12% can be reached again by 2060. In 1988, the Woodland Grant Scheme replaced the Forestry Grant Scheme, paying nearly twice as much for broadleaf woodland as conifers. (In England, the Woodland Grant Scheme was subsequently replaced by the English Woodland Grant Scheme, which operates six separate kinds of grant for forestry projects.) That year, the Farm Woodlands Scheme was also introduced, and replaced by the Farm Woodland Premium Scheme in 1992. In the 1990s, a programme of afforestation resulted in the establishment of Community Forests and the National Forest, which celebrated the planting of its seven millionth tree in 2006. As a result of these initiatives, the British Isles are one of a very few places in the world where the stock of forested land is actually increasing, though the rate of increase has slowed since the turn of the millennium. England Rural Development Programme is the current overarching grants scheme that includes money for forested land within it. Ancient woodland is defined as any woodland that has been continuously forested since 1600. It is recorded on either the Register of Ancient Semi-Natural Woodland or the Register of Planted Woodland Sites. There is no woodland in Britain that has not been profoundly affected by human intervention. Apart from certain native pinewoods in Scotland, it is predominantly broadleaf. Such woodland is less productive, in terms of timber yield, but ecologically rich, typically containing a number of "indicator species" of indigenous wildlife. It comprises roughly 2.5% of the forested area. 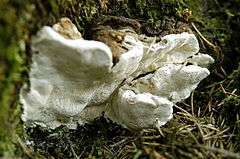 Most serious disease threats to British woodland involve fungus. For conifers, the greatest threat is White Rot Fungus (Heterobasidion annosum). Dutch Elm Disease arises from two related species of fungi in the genus Ophiostoma, spread by Elm Bark Beetles and acute oak decline has a bacterial cause. Another fungus, Nectria coccinea, causes Beech bark disease, as does Bulgaria polymorpha. Ash canker results from Nectria galligena or Pseudomonas savastanoi, and most trees are vulnerable to Honey Fungus (Armillaria mellea). The oomycete Phytophthora ramorum (responsible for "Sudden oak death" in the USA) has killed large numbers of Japanese Larch trees in the UK. Beetles, moths and weevils can also damage trees, but the majority do not cause serious harm. Notable exceptions include the Large Pine Weevil (Hylobius abietis), which can kill young conifers, the Spruce Bark Beetle (Ips typographus) which can kill spruces, and the Cockchafer (Melolontha melolontha) which eats young tree roots and can kill in a dry season. Rabbits, squirrels, voles, field mice, deer, and farm animals can pose a significant threat to trees. Air pollution, acid rain, and wildfire represent the main environmental hazards. In 2013, the UK produced 3,582,000 cubic metres of sawn wood, 3,032,000 cubic metres of wood-based panels and 4,561,000 tonnes of paper and paperboard. The UK does not produce enough timber to satisfy domestic demand, and the country has been a net importer of timber and paper for many years. In 2008 the country imported sawn and other wood to a value of £1,243 million and exported £98 million; imported £832 million of wood-based panels and exported £104 million; and imported paper and paper-based products to a value of £4,273 million and exported £1,590 million. In 2012 approximately 15,000 people were employed in forestry and 26,000 in primary wood production in the country, resulting in a gross value added to the country of £1,936 million. With the ongoing closure of sawmills, the biomass industry is likely to be a key driver for future growth. Successful forestry requires healthy, well-formed trees that are resistant to diseases and parasites. The best wood has a straight, circular stem without a spiral grain or fluting, and small, evenly spaced branches. The chances of achieving these are maximised by planting good-quality seed in the best possible growing environment. Commercial seed is relatively inexpensive,[Notes 5] but some foresters still prefer to collect their own seed. This should be done in dry weather, the seed kept in a well-ventilated place away from damp; broadleaved seeds do not keep well in long-term storage (apart from oak, sweet chestnut and sycamore, which can be kept). Conifer seed does tend to be storable. Stored seed is best pre-treated by being chilled and moistened before planting. Tree breeding programmes, to ensure the best seed, are hampered by the trees' long life-cycles. However, particularly since the 1950s, the Forestry Commission among other organisations has been running a programme of breeding, propagation, induced flowering and controlled pollination with the aim of producing healthy, disease-resistant, fast-growing stock. The Forestry Commission manages almost 700,000 hectares (about 1.7 million acres) of land in England and Scotland, making it the country's biggest land manager. The majority of the land (70%) is in Scotland, 30% of the landholding is in England. Activities carried out on the forest estate include maintenance and improvement of the natural environment and the provision of recreation, timber harvesting to supply domestic industry, regenerating brownfield and replanting of harvested areas. Afforestation was the main reason for the creation of the commission in 1919. 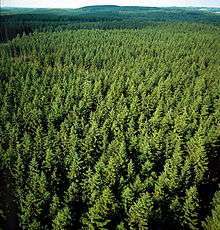 Britain had only 5% of its original forest cover left and the government at that time wanted to create a strategic resource of timber. Since then forest coverage has doubled and the commission's remit expanded to include greater focus on sustainable forest management and maximising public benefits. Woodland creation continues to be an important role of the commission, however, and works closely with government to achieve its goal of 12% forest coverage by 2060, championing initiatives such as The Big Tree Plant and Woodland Carbon Code. The Forestry Commission is also the government body responsible for the regulation of private forestry; felling is generally illegal without first obtaining a licence from the Commission. The Commission is also responsible for encouraging new private forest growth and development. Part of this role is carried out by providing grants in support of private forests and woodlands. In contrast, Natural Resources Wales (Welsh: Cyfoeth Naturiol Cymru) is a Welsh Government sponsored body, for the management of all the natural resources of Wales. It was formed from a merger of the Countryside Council for Wales, Environment Agency Wales, and the Forestry Commission Wales, and also assumes some other roles formerly taken by Welsh Government. The Forest Stewardship Council, more specifically FSC UK, sets forest management standards for the UK, promotes the system and provides an information service. It looks at the environmental, social and economic impacts of the timber industry. It has issued 2,340 Certificates of Conformity encompassing 1,609,414 ha of forest. Plans featuring "good forestry practice" must always consider the needs of other stakeholders such as nearby communities or rural residents living within or adjacent to woodland areas. Foresters consider tree felling and environmental legislation when developing plans. Plans instruct the sustainable harvesting and replacement of trees. They indicate whether road building or other forest engineering operations are required. Currently, the vast majority of Britain's timber uses road haulage. As forests are located in rural areas, the heavy timber vehicles have severely damaged many single lane tracks, especially in the Highlands. In order to combat this, companies are being forced to provide funding for repairs, as well as using alternative transport systems such as rail and coastal shipping. Despite the number of forest railways plummeting after the Beeching Axe, rail's share of timber transport has risen from 3% in 2002 with the opening of new lines in Devon, the Pennines, Scotland and South Wales by Colas Rail. The price of woodland has risen out of proportion to its productivity, and in 2012 reached peak prices over £10,000 per acre. Woodland prices are affected by its very favourable tax treatment and its high amenity value. ↑ The United Kingdom (sometimes abbreviated to UK) is a political unit (specifically a country), the British Isles is a geographical unit (the archipelago lying off the northwest coast of Europe), and Great Britain is the name of the largest of those islands. In this article "Great Britain" is sometimes abbreviated to "Britain". The adjective "British" can mean either the political or the geographical entity. ↑ All the information in the table that follows is adapted from Hart 1994, pp. 12–13, and Sterry & Press 1995. ↑ Commercial seed typically represents less than 0.1% of the overall cost of a plantation. See Hart 1994, p. 59. ↑ Hart 1994, p. 68. ↑ Fitter 2002, p. 10. 1 2 3 Forestry Facts and Figures 2014: A Summary of Statistics about Woodland and Forestry in the UK. (PDF). Forestry Commission. 2014-01-01. ISBN 9780855389147. ↑ Nix et al. 1999, p. 2. 1 2 Nix et al. 1999, p. 93. ↑ Hart 1994, p. 321. 1 2 3 4 Rural Focus: Forestry Policy, Estates Gazette, 28 July 2012, pages 56-57. 1 2 Nix et al. 1999, p. 94. ↑ Hart 1994, p. 1. ↑ Hart 1994, p. 13. ↑ Smout et al. 2007, pp. 26–28. ↑ Tivy, Joy "The Bio-climate" in Clapperton 1983, pp. 90–91. ↑ Hart 1991, p. 9. ↑ Nix et al. 1999, p. 95. ↑ Nix et al. 1999, p. 98. ↑ "English Woodland Grant Scheme". Forestry Commission. Retrieved 17 July 2010. ↑ Nix et al. 1999, p. 99. ↑ "Surprise, surprise! It's the National Forest's seven millionth tree!". WebArchive.org. National Forest. 24 November 2006. Archived from the original on 13 February 2008. Retrieved 18 July 2010. ↑ Milmo, Cahal (11 June 2010). "'Worrying' slump in tree planting prompts fears of deforestation". The Independent. Retrieved 18 July 2010. ↑ Angus (27 June 2008). "What is Ancient Woodland?". woodlands.co.uk. Retrieved 18 July 2010. ↑ Hart 1994, p. 146. ↑ Smout et al. 2007, p. 2. ↑ "Phytophthora ramorum". Forestry Commission. Retrieved 18 July 2010. ↑ Kinver, Mark (28 April 2010). "Oak disease 'threatens landscape'". BBC News. Retrieved 18 July 2010. ↑ Hart 1994, p. 229. ↑ "Dutch elm disease in Britain". forestresearch.gov.uk. Forestry Commission. 24 November 2006. Retrieved 18 July 2010. ↑ Hart 1994, p. 230. ↑ James 1966, p. 142. ↑ James 1966, p. 143. ↑ Hibbert 1991, p. 99. ↑ Forestry Commission 2009, table 9. ↑ Forestry Commission 2009, table 7. ↑ Forestry Commission 2009, table 12. ↑ Forestry Commission 2009, table 13. ↑ "Who owns Britain: Top UK landowners". Country Life. 11 November 2012. Retrieved 14 May 2012. ↑ "Forestry Facts & Figures 2011" (PDF). Forestry Commission. 2011. ISBN 978-0-85538-852-2. Retrieved 18 July 2012. ↑ "History of the Forestry Commission". The Forestry Commission. Retrieved 11 April 2012. ↑ "Government Forestry and Woodlands" (PDF). Defra. Retrieved 7 June 2013. ↑ "Felling Licences". Forestry Commission. Retrieved 18 May 2012. ↑ "Welsh Government - Natural Resources Wales". wales.gov.uk. 9 April 2013. Retrieved 2015-07-27. ↑ Choreley, Stephen (6 Jun 2000). "EXTRAORDINARY DAMAGE TO THE ROAD NETWORK CAUSED BY TIMBER VEHICLES" (PDF). east-ayrshire.gov.uk. EAST AYRSHIRE COUNCIL DEVELOPMENT SERVICES COMMITTEE. Retrieved 27 Jul 2015. ↑ Högnäs, Tore; Spaven, David (23 Aug 2002). "MORE TIMBER BY RAIL – A CASE FROM FINLAND" (PDF). www.timbertransportforum.org.uk. The Timber Transport Forum. Retrieved 2015-07-27. ↑ "Traffic". Railfan's Traffic Guide. North Wales Coast Railway. 11 February 2013. Retrieved 23 May 2013. ↑ "Crianlarich timber railhead: feasibility study Final Report to Forestry Commission Scotland" (PDF). timbertransportforum.org.uk/. January 2012. Retrieved 22 Jul 2015. Clapperton, Chalmers M. (1983). Scotland: A New Study. Newton Abbott: David & Charles. ISBN 0-7153-8084-2. Fitter, A. (2002) . Trees. HarperCollins. ISBN 0-00-711074-X. Forestry Commission (2009). Forestry Facts and Figures 2009 (PDF). Forestry Commission. ISBN 978-0-85538-790-7. Hart, C (1994) . Practical Forestry for the Agent and Surveyor. Sutton Publishing. ISBN 0-86299-962-6. Hibberd, B. G. (1991). Forestry Practice (11th ed.). Forestry Commission. ISBN 0-11-710281-4. James, N. D. G. (1966) . The Forester's Companion (2nd ed.). Oxford: Basil Blackwood. Nix; Hill; Williams; Bough (1999) . Land and Estate Management (3rd ed.). Packard Publishing. ISBN 1-85341-111-6. Smout, T. C.; MacDonald, R.; Watson, Fiona ("Smout et al.") (2007). A History of the Native Woodlands of Scotland 1500–1920. Edinburgh University Press. ISBN 978-0-7486-3294-7. Sterry, P.; Press, B. (1995). A Photographic Guide to Trees of Britain and Europe. New Holland Publishers. ISBN 1-85368-416-3. Wikimedia Commons has media related to Forestry in the United Kingdom.